Pure is all about wireless audio, and that’s what the alleged "room-filling" - not literally, just with audio of course - Pure Jongo T6 is all about. In a world where we’re connected to the cloud, where smart devices come with Bluetooth, and where home Wi-Fi networks are commonplace it’s an ideal way to deliver music. No wires, no mess - control your audio experience via a smartphone app, plug a device in via 3.5mm, stream radio, it’s all easily done with the Jongo T6. If all this sounds somewhat familiar, it’s because Sonos has already made its bed in the multi-room wireless audio industry, albeit using a mesh network rather than Wi-Fi. Is Pure on the back foot compared to its nearest competitor or is the Jongo T6 Wi-Fi and Bluetooth speaker able to hold its own? We’ve broken the speaker in and have been listening for a number of weeks to see what we make of it. The Pure Jongo T6 is a fairly large device; a little larger than a classic bookshelf speaker at approximately 20cm tall and 37cms across. The device has a sort of soap-bar shape to it - it’s rounded off towards its outermost edges in a pinched-in fashion. It’s harmless looking, but then we’re not entirely inspired by its looks either. The build is a bit plasticky too, and given similar price bookshelf speakers come in wood finishes that might not suit all. Front-on, there's a black material that covers the two 5-inch speakers hidden beneath, with only a circular Pure logo otherwise visible to the front. When it comes to connectivity there’s Wi-Fi and Bluetooth - we’ll touch on that more later - in addition to a 3.5mm jack to the rear for hard-wired audio connections. Tucked away around the back is a USB port for an optional Ethernet adaptor should you lack Wi-Fi, but that's not something we needed to use for this test. Controls on the device are kept simple: there’s an on/off button that glows up green when connected, along with plus, minus and mute volume controls to the upper side. To the rear there’s a Wi-Fi button used for when setting up but, otherwise, that’s it. There needn’t be many on-device controls, as part of the point of the Jongo T6, and Pure products as a whole, is that they’re music receptacles - the controls and content come from elsewhere. Whether it’s a straight-up Bluetooth connection from a computer or smartphone to mirror your audio output, or you download Pure Connect to your computer or smart device, these are the hubs that will provide more control - just like a personal remote. We’ve been using Pure Connect on our MacBook Pro and via the HTC One and have found the Pure software broad in its abilities. On the surface of it you can stream your own purchased content direct from the device, which is put into the Pure library. 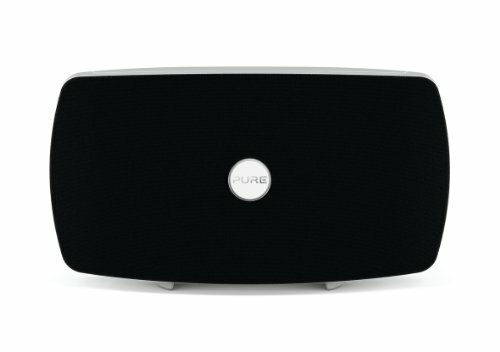 Alternatively there are other sources, such as internet radio or - and here’s where Pure "does a Spotify" - Pure Connect packages for online streaming at £5 a month or online and offline for £10 a month. There are several million tracks available, so no shortage of music. The browser and app-based versions work well, deliver recommendations, a history of what you’ve listened to, or you can browse through charts, genres, new music or search out what you’re after. But what any audio device should be all about is its sound quality. When we first turned the T6 on we weren’t exactly blown away, but this was at a point where we’d got used to listening to tunes throughout the office from the Philips Fidelio HTL9100. And that comes complete with a subwoofer - something that the Pure product lacks. Undeterred we thought we’d give the Jongo T6 its dues and have been listening to it ever since, in part to help "break it in" to see whether its low-end output would pick up. It’s not that there’s no bass, but truly low-end stuff does lack and, considering the size of the T6, we’d have liked a small down-firing sub to have been included in the build to give a little added thump in the lower frequency departments. If Pure introduces a separate subwoofer we can imagine that the two paired together will boost the sound to another level, but as it stands that kind of thump lacks for our tastes. The balance of audio is angled far more towards the top-end, and while any given tune with its fair share of shakers and hi-hats will sparkle, it sounds over-bright in the mix and that can be a bit overbearing at high volume. The mids and highs sounds stereo separated in a way that sometimes makes them sound a little too separate too. To counter this balance we'd like a little more control overall. Throw in some user-controlled equaliser pre-sets or full manual EQ adjustment in the app as such personalised manipulation would elevate the Pure sound. Volume is no issue, though, and the T6 does live up to its "room-filling" promise, able to kick out an ample amount of noise. The two speakers are 50W a piece, which may not sound huge on paper, but the 100W total is more than enough in the real world. We’ve settled in with the Pure Jongo T6 and while we’ve succumbed to many of its charms, there’s this niggling scratch in our minds. Where’s the big bass? For the £300 price tag there’s just not enough of the low-end, while the scattered top-end sound doesn’t deliver as smooth a listen as we’d like. Then there’s the obvious Sonos comparison too. Something like the Play:3 has a richer sound in our opinion and costs a touch less. Overall the Pure T6 is as much a success on the connectivity front as it is slightly disappointing in its audio output offering. There’s the makings of something solid here, and it doesn’t sound bad by any means, it’s just not quite met our expectations at this price point.